This months release includes a carefully styled blog layout allowing you the perfect platform to share your news articles. Beautifully crafted to blend seamlessly with Scarlett's clean styling, your articles will display clear and concise making it a pleasure for your audience to read. 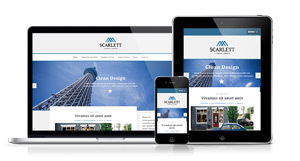 Scarlett's comes bundled with a wide selection of Joomla51 module extensions allowing you to quickly and easily implement content for your site. Among these total of eight module extensions is the new J51 - PricingTable module which allows you to create perfect pricing tables to showcase your products. This versatile and fully responsive solution comes with plenty of styling options to create the perfect table to match your website design which can then be easily linked to further articles or your eCommerce/subscription extension. Additionally you will also find included a simple profile module which will sit perfectly in any about or meat the team sections of your site. Easily create profile cards which include profile image, title, position and social media links in a matter of seconds. Option wise Scarlett will not disappoint. Template parameters include all the features that are common place among other Joomla51 products. Have complete styling control with a host of coloring options and font changers for almost every element of your fully responsive design. Check out some of the examples style in the template demo to get a feel of how flexible and versatile our Scarlett Joomla template really is!